The WebSmart AT-FS750/48 features 48 10/100TX ports + 2 gig uplink ports (10/100/1000T or SFP). It is an ideal fit for the SMB/SOHO market. 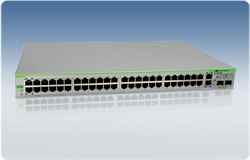 This switch provides managed features ideal for simple QoS applications, and provides basic monitoring tools to improve your network. The Web Smart functions provide QoS features suitable for multimedia applications. With the web-based interface, you can set up 802.1Q VLANs to segregate traffic, QoS to prioritize mission-critical data such as voice or video packets, and link aggregation to create traffic pipelines. The AT-FS750/48 also provides network monitoring tools such as port mirroring and basic port statistics. Remote product management enables simple monitoring from anywhere.